Distribution of the molecular forms of MUC5B following secretion from non-CF and CF HTBE cell cultures. After washing the apical surface, HTBE cells were stimulated apically with 100 μM ATPγS to induce mucin secretion. Apical secretions were collected in PBS at 2 minutes and 240 minutes after ATP challenge and immediately added to 4 M GuHCl to preserve the molecular forms of mucin. Secretions were then subjected to rate zonal centrifugation by a 6–8 M GuHCl gradient to separate the molecular forms of MUC5B. 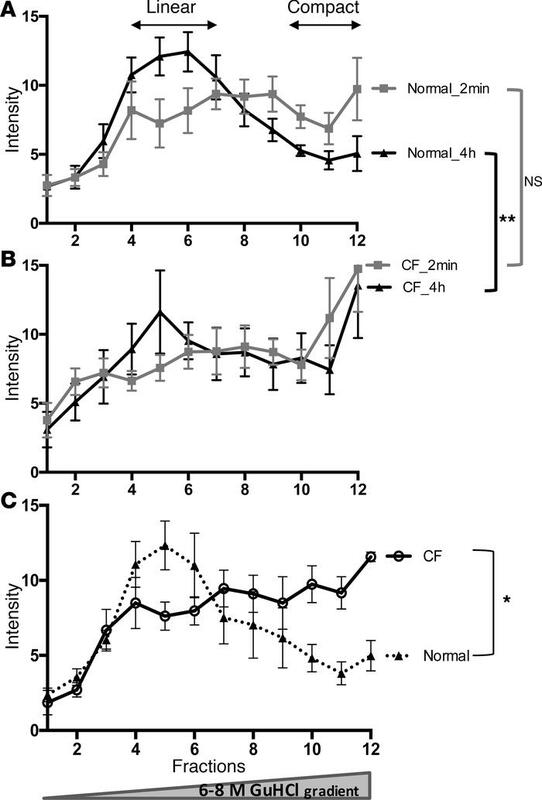 (A and B) At 2 minutes, in the ATPγS-stimulated non-CF and CF HTBE cell secretions, MUC5B has similar profiles and is found predominantly in the high-density “compact” region. (B) However, the MUC5B profile in the CF cultures shows no progressive shift from the high-density region to the low-density region, as is observed in the non-CF cultures, suggesting the MUC5B stays predominately in a compact form in the CF cultures (**P = 0.01). (C) The distribution of the molecular forms of MUC5B in “accumulated” secretions in non-CF and CF cultures. Unstimulated basal secretions that accumulated on the surface were subjected to the density gradient. The MUC5B profiles indicated that the mucins recovered from the accumulated (72 hours) mucus from non-CF cultures resolved predominately in the low-density region as the linear form, whereas the majority of the MUC5B from CF HTBE cell cultures was found in the same high-density region as the compact form (*P = 0.01). SD values are indicated by vertical bars. Unpaired, 2-tailed t test was used to determine statistical significance.